Issued on the Prism CD "The Music Never Died"
Note : During recent years Billy Walker has stated that he only "shared" a session with Holly and Holly is not playing on these songs, although it has been stated in the past that Buddy indeed was the guitarist. 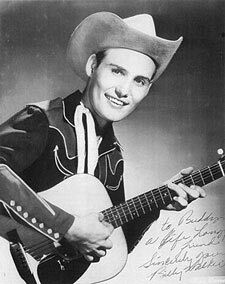 Recently, just before his death in May 21, 2006, Billy Walker was interviewed by Jack Kegg : In 1957, Billy was asked by friend Norman Petty to record at his Clovis, N.M., studio. Billy recalled, “I rode over to Clovis with Joe Mauldin, one of Buddy Holly’s Crickets.” Buddy recorded two songs, “Words Of Love” and “Mailman Bring Me No More Blues.” I had in mind a song written by Slim Willet called “On My Mind Again.” Norman Petty wanted a vocal group to back me up, and Buddy said, “hey, we’re not doing anything. Let’s go, fellas,” and Buddy Holly and the Crickets sang background vocals.There is no doubt that “On My Mind Again” would have been a huge pop hit. The record was on the Columbia label, and since Holly was in contract to Decca/Coral/Brunswick, their names could not be on the label. He thought “Words Of Love” should’ve been a big hit for Buddy. “The Beatles copied his style, and copied it well,” he said. Unknown date - Overdubbed backing vocals on take 2 by The Roses : Robert Linville, Ray Bush, David Bigham. Many believe that the guitar break on this by Buddy Holly is the best non-Crickets solo he ever did ! Not Fade Away (alternate version) This is a splice. It was spliced by MCA in 1984 to make a full master. The first part (0:50) with the backing vocals included is the master version. The rest is the alternate. This is because the alternate was not a complete recording when it was discovered. These three tracks issued on the Prism CD "The Music never died"